About 25 minutes south of Nashville, in the little community of Thompson Station, is the most unlikely of restaurants. Sitting on fifty acres and surrounded by pastures, trees and rolling green hills, is a stately old plantation house and, now a restaurant, called Homestead Manor. Construction on the home began in 1799 and was completed in 1819. Most of the materials used in the building of the house came from the property. Hand hewn wood floors, plaster walls and 12 foot ceilings, 9 fireplaces and wide porches all harken back to the early part of the 19th century. Every room in the house is dedicated to a different chapter in the home's history and the history of the surrounding community. One room tells the story of young Alice, with a portrait of her on the wall as well as a flag embroidered with the words of Colonel S.G. Earle of the 3rd Arkansas Calvary, "Boys, a woman has your flag!" A cannonball from the battle is also on display in this room. If walls could talk, this house would have lots to tell. On March 5, 1863, seventeen year old Alice Thompson, daughter of Elijah Thompson, for whom Thompson Station is named, and other women from the area, hid in the cellar of the home as the Confederate army marched across the property toward Union lines. As the ladies watched the Battle of Thompson Station unfold from a tiny window, they noticed that the standard bearer for the regiment had been hit. Young Alice, ran outside and grabbed the flag and held it aloft to urge her troops on. At the end of the five hour battle, the home became a hospital for the wounded soldiers and Alice and the other women tended the injured and dying. Blood stained wood floors on the upper level of the house are a visual reminder of the horrors of war. Another room, dedicated to the importance music has played in this part of Tennessee, showcases musical instruments. Guitars signed by famous musicians line the walls and a chandelier made of old piano keys found on the property casts a disco-like glow over the room. The technological room highlights changes in technology as seen by the different machines, tools and implements that were used on the property at one time or another. All of the items showcased in this room were found somewhere on the estate. A flag with 34 stars is displayed in the blue and gray room, dedicated to the history of the Civil War. The flag became the official flag of the United States on July 4, 1861, after Kansas was granted statehood. The only president to serve under this flag was Abraham Lincoln. Many artifacts have been found on the property over the years. They are lovingly displayed throughout the home, including the grand entrance hall. Also of interest are the squares of stained glass over the front door. They repeat in a strict AB color pattern until the last square. The last square is the same color as the preceding square. Our hostess told us this was a code for the Underground Railroad, to let escaping slaves know this was a safe place to hide. I could not confirm this in my research, but if true, it makes the home and its occupants even more interesting. Outside, the grounds of Homestead Manor are meticulously cared for and watched over by a pretty little garden angel. The garden on the front lawn makes a beautiful view from the upstairs porch. But Homestead Manor is more than just pretty. It is a working farm. Ten acres of the property are dedicated to sustainably support the restaurant with a garden and orchard. Yes, we did mention that Homestead Manor is now a fine dining restaurant, which is why we ended up at this hidden jewel. The home is now owned by the same family who owns several restaurants in and around Nashville, including Puckett's Grocery and Puckett's Boathouse. We told you about Puckett's Boathouse when we visited our niece, Kelly, in Franklin. Our tour of the home actually came at the end of our meal. For dinner, we were seated in the bar area at the back of the house, where we could look across through the windows and see the cooks pulling pizzas from the large brick wood fired oven. Our server brought our menus, a cosmo for me and a basket of homemade bread with herb butter for us to munch on while we made our selections. That herb butter was so good! I made my selections from the appetizer menu with soup, house salad and a tray of pimento cheese and hoe cakes. Everything I had was delicious. I especially liked the rich, brothy beef soup with mushrooms and the creamy pimento cheese. If I had one critique to make it would be that I prefer my hoecakes thinner and crispier, but that is a personal preference. The salad was lovely with thin slices of rosy beets, radishes, tomatoes, carrots and crispy greens. I could have sipped the champagne vinaigrette with a straw, it was so good. Yum! Scott chose the grilled hangar steak. It came with smashed fingerling potatoes, fried garlic chips, baby greens topped with a mustard vinaigrette and bearnaise sauce. We both liked the dish, although I think I liked it even better than he did. The meat had a lot of char on it, which I love. He prefers a bit less. We were way too stuffed for dessert, but I did check out the sweet offerings for your information. They had lemon ricotta cheesecake with blueberries, black forest cake with brandy soaked cherries, strawberry shortcake and house made gelato. Everything sounded delicious! One other thing. While we were touring the cellar, our hostess and guide told us the room is now used for private dining. They have set up a chef's table, where guests can dine in privacy and the entire dinner is designed around your preferences and requests. The candles are lit and the mood is set for a one of a kind dining experience. I so want to go back and reserve the chef's table! Homestead Manor is also hosts events, both public and private. While we were there, the staff was busy getting ready for a wedding reception complete with a white buggy for the newly weds. Tables were being set up in a nearby barn. And we noticed a couple of spring events open to the public on the event board. If you would like to visit Homestead Manor, the address is 4683 Columbia Pike in Thompson Station, TN, just south of Franklin. The restaurant is closed on Monday. Hours vary slightly each day, opening a bit earlier on Saturday and Sunday and staying open a bit later on Friday and Saturday. They are open for lunch, dinner and Sunday brunch. For more information about Homestead Manor ,check out their website. 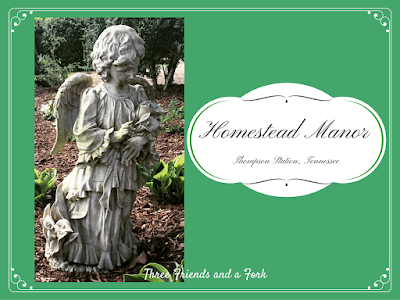 Three Friends and a Fork give Homestead Manor 3 historic Yums UP! The next time you are in the Nashville area, visit Homestead Manor, and be sure to ask for a tour of the home!